In Anemoi two performers carry two long tubes. There is a microphone in each tube. By changing the direction of the tubes, they catch the sound of the wind, environmental sounds or create filtering effects (the reflection of sounds against walls and buildings). The performers can also play the tubes as a percussion instrument or flute (there is one small hole in the tube through which they can blow or breathe). They also close or open the tube at one side with their hand. The performers stand on a roof or elevated location to catch the wind. • performance: 17 December 2018 on the Experiments are More Refreshing than New Socks (Research Festival) of the Conservatory in Antwerp. 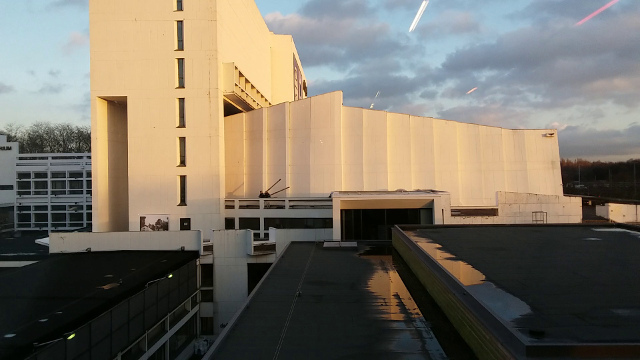 The two performers were Ruben Orio and Hans Roels and stood on the roof of the Singel, the audience was watching through the windows of another building of the Singel. In the composition Glass the audience is seated indoors, in a space with large windows, as an office or bar. 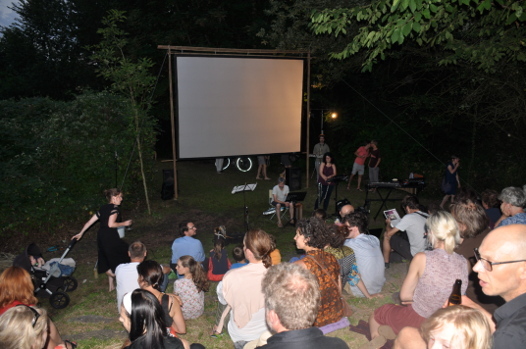 In the first performance at the Oortreders festival in Belgium the audience was looking at a landscape with a street, a sports ground and trees. Through open doors they acoustically heard the outside sounds. Two performers with microphones were walking outside. Using omnidirectional, directional and close microphone techniques they brought (selections of) outside environmental sounds to the PA speakers in the audience space. Two other musicians played percussion and synthesizer, both inside and outside the audience space. Sometimes they were audible acoustically, sometimes amplified through the PA speakers, when the microphone performers picked up their sound. Glass wants to be musical landscape art in which inside and outside spaces, performed music and indeterminate environmental sounds create an overarching, audio-visual composed space. A kind of dream space in which you are both observer and participant. The dream is collective, not individual. • performance: 20 October 2018 by the Collectief Publiek Geluid ('Collective Public Sound') at the Oortreders festival. Rolling Band is a work for several walking performers, moving a trolley suitcase along a trajectory with different street stones. The performers try to play together with a rhythmic click track transmitted via a wireless sender. You can find more information on my blog (on on-site music): here. • live audio recording (fragment) of the try-out. Not necessarily music is a work for 'silent' musicians: people can just watch the performance or - if they want to - listen via a headphone. This work is an ode to a public, quiet place like the Krook library in Ghent (Belgium). Thanks to technology such as smartphones, internet or headphones people can not only work, study or read at home or in their office. They can also listen to music or play piano in a public space such as a library. In this library there is a silent grand piano on which people can play or practice with headphones on. Performing music becomes a semi-private, semi-public activity in this way. Passer-bies see an intriguing visual performance but they can only guess what the musician is playing for him/herself. Just as you can only guess which messages you see people sending, or which sounds the outdoor environment - visible through large windows - is making. This game of exposing and hiding, and creating a public space, controls Not necessarily music. In some sections the musicians are only playing for themselves. Nor the co-performers, nor the audience hears the 'original' music. In other sections they only play visually together or they listen to the same environmental sounds (arriving from a microphones placed outside the windows of the building). Finally, they also play together as 'real' musicians, listening to each other. • performance: 23 May 2018 in the reading room of the Krook library (Ghent) by Ana Filipa Botelho (wind controller) and Quentin Meurisse (keyboard). • live audio recording of the first performance on 23 May 2018. • the score and extra documentation. A living room, house or concert hall has borders, creating an inside and outside experience. Enclosed spaces - and their borders - leak and bring sounds from outside to the inside space. When the inside becomes silent - at night - the walls become audible and start to speak. In No Room the surrounding architecture of an enclosed space is explored. Performers play outside the concert space on adjacent walls, floors, pipes, ventilation systems, etc. The sound reaches the audience through these walls and architectural objects. A microphone also records sound in real time outside the concert space and fragments of this live recording are played in the concert space. • performance: friday 8 december 2017 in Miry Zaal (School of Arts, Ghent) by the Third Guy. 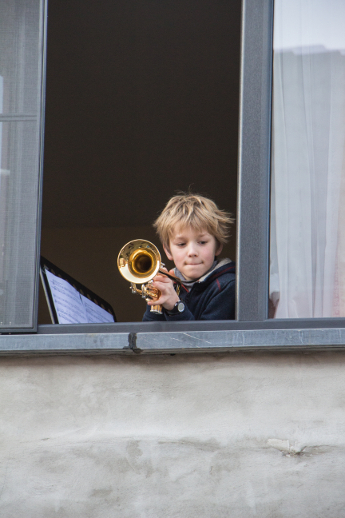 In Music Street local musicians play from houses with open windows or doors. The audience walks in a street parade together with two accompanying musicians. This results in a collage of music fragments blowing through the street. This work wants to reveal the (sound) diversity in a neighbourhood: the multiple music styles, the various ways to enjoy music and the sound transformations by the local architecture and acoustics. • performance: saturday 21 January 2017 in the Biekorfstraat and Zeemstraat (Ghent), realised in collaboration with the neighbourhood committee de Biekorf. From 20 locations along the trajectory of the parade more than 25 (mainly amateur) musicians performed, together with Aya Suzuki (percussion) and Thomas Moore (trombone) in the parade. • live recording of the whole performance of 21 Januari 2017. In an open landscape musicians walk away from the audience, the performers play instruments with different loudness levels. The place and moment at which their music disappears, becomes inaudible and is absorbed by the environment is different for each performer. The audible horizon of each performer lies at a different distance from the audience. Each musician plays his own music and walks his own trajectory. This creates a spatial polyphony of distinct parts that gradually become softer and are transformed by the environment and its sounds. • performance: 22 december 2016 in the Park Spoor Noord in Antwerp, performers: Thomas Moore (trombone), Aida Lopez (piccolo) and a bagpipe band (Metropolitan Antwerp with Adam Clarke). The music that was chosen to create this specific version of Hearizon was based on the visual and auditive experiences in this park. This music was: Eisenbahn-Lust-Walzer by J. Strauss, the song In diesen Wintertagen by A. Schoenberg and the traditional Green Hills. 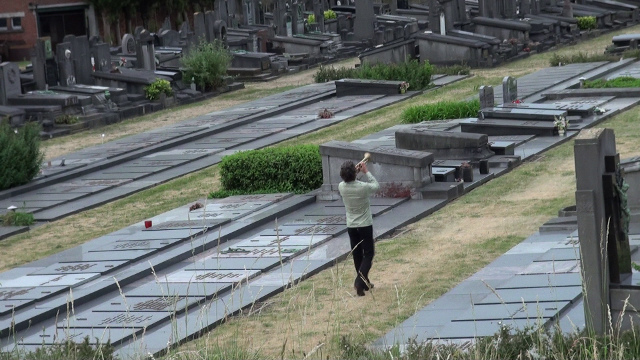 • performance: 2 june 2017 at the burial site Campo Santo (Ghent), a version with trumpet (Bert Bernaerts), saxophone (Pol Mareen) and percussion (Wim Konink). The music for this specific version of Hearizon was the Renaissance Villanelle 'Io volo sopra il cielo', the folk song 'Ich habe der Fruhling gesehen' and the romantic song 'Die Jungfrau und der Tod' (Carl Loewe). This choice was based on the contradiction at Campo Santo between the beautiful (spring) nature and wide, open sky on the one hand, and the graveyard and related themes such as death and departure on the other. • live recording: the first 10 minutes of the performance at Campo Santo (trumpet, baritone sax, glockenspiel and environmental sounds such as an air plane, train, birds, etc.). Plain is a work for an inside space or a small, enclosed outside location. Continuous homogeneous tones or noise sounds are triggered or stopped by short sounds. All sounds are based on the frequencies, sounds, materials and architecture in the performance space. Consequently an alternation is created between static, frozen sounds and silences, after which new and old (voluntary and involuntary) sounds appear. • performance: 27 october 2016 in the reading room of the library of de Singel (Antwerpen) at the Articulate Research Days. • instrumentation: minimum four performers. The number of performers depends on the size and acoustics of the concert location. • the score and extra documentation of this text score. 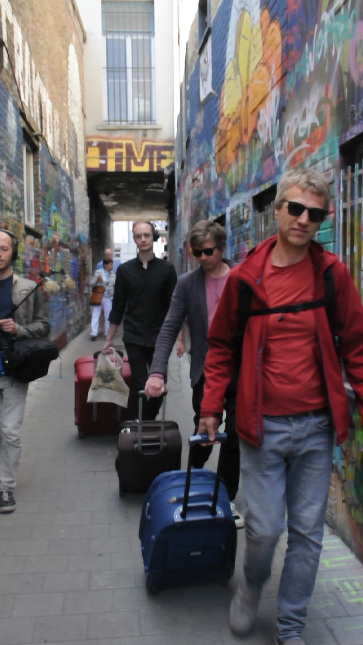 Beving Rozebroeken (Bebung) wants to make the concert site vibrate audibly. The main (instrument) part requires multiple performers to beat on plants and objects (trees, stones, water, park benches, garbage, bicycles, etc.) situated at the concert site or characteristic for this place. The audible, present environmental sounds are part of the performance, but the focus is more on the hidden, implicit sounds the are contained in objects and need to be brought to life. More information available on my blog. • performance: 27 August 2016 in Rozebroeken park during the Cinepuur festival (open air film), supported by the City of Ghent. • live recording: the first five minutes of the performance in Rozebroeken park. • the score and the video (animated score) for the percussion part (on site-specific objects). Open Fields is to be performed in a large (outdoor) space. Four musicians are spread at a large distance around the audience, while three other players are located near to the audience. During the performance three of the four (far-away) performers gradually move in the direction of the audience. This piece builds upon the 20th century tradition to exploit the location of instruments in a music performance. In this work I try to obtain an auditory transparency: the music should not only draw attention to itself but also to the surroundings. During a concert the audience should not only hear the music, but also experience and learn about the concert environment. Similar to the previous composition (fl)ASH this work consists of short fragments in diverse styles that are announced or cut off by the (solo) percussion. Rasuren stands for an old correction method by which mistakes were scratched off the paper with a knife and corrections were written on top of them. Rasuren is partly inspired by the creative process of Beethoven who wrote many sketches and versions while composing. • written for the Deleuzabelli Variations project of Paulo De Assis and the Hermes Ensemble. • performances: 29 september 2015 in the School of Arts Ghent and 9 november 2015 in the Bijloke concert hall of Ghent. This work was made for a visual installation of the artist Alice De Mont. The composition consists of five parts or sections that can be performed in any order, with repetitions and/or omissions. The instrumentation is free and the musicians are invited to find different ways to perform staccato sounds (with pitch) on their instrument. The timing of these short notes is written in free time, resulting in a heterophonic texture. (fl)ASH is based upon the blinding effect of a short music fragment. If a music fragment of a few seconds is followed by a silence, a moment of dazzlement is created during which the listener can think about the fragment and try to re-imagine it. By abruptly breaking off the fragment I try to strengthen this 'internal reverb' effect (in the head of the listener). (fl)ASH is a static composition that stresses the 'here and now'. The structure is minimalistic and suggestive: in the short term there are repetitions of (similar) fragments, but on the long term -time structures longer than 30 seconds- there are almost no references to previous fragments. Moreover, the listener can create his/her own relations between the diverse fragments. (fl)ASH is notated as an open, graphic score for which unfinished music has to be searched. The fragments are chosen from works that were never finished by the composer, often because he/she died during the composition process or because the material production (e.g. of an opera) appeared to be impossible. The first version of (fl)ASH used fragments of unfinished compositions by J. Haydn, J.S. Bach, W.A. Mozart, Fr. Schubert, H. Berlioz, F. Mendelssohn, Pappalardo, C. Saint-Saens, Fr. Liszt, Cl. Debussy, H. Vieuxtemps, G. Mahler, A. Bruckner, L. Ornstein, B. Bartok, A. Webern and Sorabji. Fragments were also based on my own sketches and sketches of (the performers) Patrick Housen and Dennis Allegaert. The piano and the piccolo play a central role in this work. Both go their own way: the piano in the foreground, the piccolo in the background. The other instruments of the ensemble create a environment of short, contrasting fragments around these two instruments. Some ensemble fragments -almost- develop into an independent third voice, other fragments appear just once, as a chance event. This work tries to create a sense of musical dept or distance. The spatialisation of the performers, the timbre and the musical material serve this goal. To synchronize the parts with their own, independent tempi, the piano functions as a kind of clock. Almost all the synchronization cues are based on this part, thus the other instruments mainly follow the piano. As in chamber music, the ensemble of 7 instruments can play together without a conductor. This work is written for 3 pianists playing one piano. The performers play five layers or voices which have their own independent character, tempo and style. The work originated from a desire to create a work for an intimate ensemble -performers very close to each other- where each voice has enough space to develop its own personality. The synchronization between the voices with their own tempi and character happens without a chronometer, metronome or conductor. Thanks to the physical proximity of the performers, a complex synchronization with visual and auditive cues was possible. The movements of one performer, his score and the instrument on which he is playing, are situated within the visual and aural field of the other performers. To emphasize the timbre differences between the voices, several extended piano techniques are used, for example a piece of cloth is placed between the strings and hammers of the piano to create a very muted sound in one of the voices. Chunks & Streams is dominated by a continuous flow of heterogeneous musical textures and events on top and after each other. Longer fragments of music are compressed into shorter fragments by presenting extreme short samples sequentially after each other or by combining different musical ideas simultaneously. The result of this manipulation of our perception of time and our perception of identity and difference is an overall form which is at the same time audible and unpredictable, a stream of sounds and musics which is chaotic but not loud nor hectic. This composition was made in close collaboration with the Zwerm quartet. After a first rehearsal during which the performers and the composer experimented with the multiple speaker setup and with the simultaneous combination of heterogeneous musical material, the time in between the next rehearsals was used by the composer to organize and finetune the material. In the final score improvization still plays an important role but the structure and spatialization are fixed, as are the general features of the various musical textures. Just as Threeway I (Drieweg I) this composition is a polyphonic piece in which the parts have a very high degree of independence. Very occasionally there is some active interaction between the performers. In general every performer concentrates on what he is playing and perceives the other musicians as if they are 'in the background'. This piece wasn't written for 4 specific instruments, it has an abstract score that can be played by several instruments (with certain characteristcs). • performances: a first version of Threeway II was performed by Hans Roels and Fabian Coomans on the festival Jazz & Sounds (February 2010 - Ghent). Further performances by Manama students of the Royal Conservatory of Ghent (February 2011) and by students van York University (Music Department) in May 2011 on a concert of the seminar 'Embodiment and Experiment'. Gort is the name of a town and river in Ireland. The region around Gort is known for its underground rivers. They disappear underground, emerge at the surface and sink underground once more in complex patterns. As a child I was fascinated by the appearance of these rivers in the middle of a field or some hundred meters before they poured in the sea. The performance techniques used in Gort produce by-sounds. Often the pitched sounds disappear in these by-sounds and a few moments later they emerge again. Whether 'undergroud' or 'overground' the music continues very intensily, very softly and full of energy. Normal bowing techniques almost aren't used in this piece. In Soffitto a piano keyboard is connected to a computer that controls an automatic organ and xylophone. After experimenting with musical techniques, ornaments, chords and phrases that fit with these automatic instruments, Hans Roels developed algorithms (in Pure Data and Python) that change the input from the keyboard during the performance. Some details and structural elements were fixed more or less in advance, while others are totally 'open' and can be changed during the performance. Just as in live electronic music composition, improvisation and interpretation are almost inseparably connected. • more information in the score and files (Pure data file: soffitto-1.pd, Python file: glisclus7.py), Pure Data (Pd), Python and the Python external for Pd need to be installed, this external can be found on this site. • more information on the computer controlled music instruments, built by Godfried-Willem Raes. Threeway (Drieweg) is a polyphonic piece in which 3 main instruments play in a seperate tempo and a fourth follows and accompanies this trio. This piece wasn't written for 4 specific instruments, it has an abstract score that can be played by several instruments (with certain characteristcs). The first version was played in the Logos Foundation on a toy piano, a melodica and two synthesizers but f.e. a performance with xylophone, clarinet, cello and accordeon or mandolin, accordeon, bass recorder and harmonium is also possible. Threeway almost sounds as a soundscape with three clear and seperate voices that go their own way but -as if by accidence- fit together well. Between 2007 and 2010 Hans Roels has teached live electronic music to a group of teenagers and amateur musicians. Because there aren't many compositions that can be played in these lessons he started to compose a cycle of works. These pieces are mostly based on one specific technique from electronic music. They also want to demonstrate the diversity within live electronic music. The approach, style and peformance requirements differ a lot. Often the performers need to improvise. The software that is used in these works is the free and open source program Pure Data running on Linux, Windows and Apple. Special hardware (like certain types of synthesizers or effect machines) is avoided. Radio South is a piece for 8, 12, 16 or 14 radios that can be performed by children or teenagers. I borrowed the idea to make a piece for radios from John Cage. Every performer has to memorize 2 places on his radio: 1 radio station (music or voice sounds) and 1 place inbetween 2 radio stations (all kinds of noises). The players are standing in the public. A piece in which 11 computer controlled automats are being played through a MIDI keyboard. Only the key chambers of the 3 organ automats are used to produce noise. For every automat I programmed a different way of playing. Three very short parts (consisting mainly of a melody) were composed in advance. By chosing the repetitions and the order of these parts during the performance, the piece gets its shape. Slow Motion is in fact a patch in Reaktor that enables a performer to improvise with 11 music instruments. What the individual automats play, can be made in advance, generated by a (melodic) algorithm or improvised on the keyboard. Therefor, every performance sounds different. The noise machines (like <PSCH>, <SPRINGERS>, <THUNDERWOOD>) give the performer the opportunity to play with different kinds of noise while the automatic harmonium enables the audience to hear very tiny differences in amplitude. These two characteristics are used a lot in Slow Motion. In Point Black the pianist doesn't only play on the keys of the piano: he also plays on a cardboard box, he whistles and uses his voice. Some piano keys are prepared: rubber, bolts and other things are placed between the strings. The electronics (made with the Reaktor software) are mostly based on the granular synthesis of 3 short samples. Apart from this I also made an audio effect that modifies the dynamics of the voice and box sounds. In Different Ways three spaces (rooms or halls) are used. Musicians move from one room to another, causing a constant change of the instrumentation in every room. Whereas in the first hall there are microphones, in the other two there are speakers. The performed music in the first hall is used as the basic material for the live electronics of the two computers. The result is played in the other two halls. In this way the processed sound becomes a part of the instrumental ensemble in those two spaces. Although the music originates from the first room, the character of the music is entirely different in the other two rooms. This piece is a experiment with polyphony, electronics and space. The cello for example, plays together with a vibraphone in the first hall; at the same time the processed cello sound is part of a trio with recorder, violin and electronics in the second hall; simultaneously the cello is playing a quartet with euphonium, accordion, clarinet and electronics in the third hall. In Temperate Music the music changes according to the season and the weather. I'm fond of the idea that some things are not always present but appear at one moment and then disappear again. In Temperate Music a musician plays a keyboard and seven controllers. On the screen of the computer he can see the evolution of the piece and the scales (in quarter tones) that he can use. The resulting monophonic melody is processed in the computer resulting in a more or less polyphonic piece. The sound is mainly made using FM synthesis (no samples) and partly also with physical modelling techniques. A few hours before the performance the musician enters the characteristics about the season, wind strength and the temperature. The computation of these data results in new material that is necessary for the structure of the piece and for the realtime processing of the sound. After a first tryout of this piece (in Logos, July 2005) I realized that this basic computation took too much time in Reaktor (software). So now I have written this code in Python, here you can see this python file which generates a list of data. During the live performance some parameters are free and can be used to improvise, others can't be changed because they are part of the (weather dependent) structure of the piece. In fact, Temperate Music is a combination of an electronic instrument and a piece (or improvisation structure) that both change according to the weather. • I have made a demonstration of the live processing: here you can hear the basic input (that is played/improvised on the keyboard). This is what the monophonic melody becomes after being processed (and with the live controllers added). In 1998 I wrote a piece called Nowhere's Chaos which was performed several times at the November Music Festival in Belgium, Germany and The Netherlands. As the recording of the piece wasn't very successful and a strange combination of instruments was used, I found this piece rather "useless" and started using the recording as raw material for all kinds of audio electronics (experimenting with the Reaktor software). In the original version Nowhere's Chaos texts from the Zapatista uprisings in Chiapas (Mexico) were used. Colo is dedicated to the village community of Colo(tenango) in Guatemala where 2 people where killed in March 2005 during protests against a free trade agreement with the US. A few years ago I visited this village and the farmer organisation that organised the protests in March. In 2002 I wrote the piece Ohne Worte I to commemorate the concentration camp of Breendonk (B). My enthousiasm for the applied instrumentation (2 fixed musicians -voice and viola- and two flexible musicians -of which one has to be technically minded) encouraged me to write a second part. In both parts the words of these politically inspired pieces cannot be recognised. This second part is dedicated to the Israelian technician Mordechai Vanunu who revealed the existence of Israelian nuclear bombs. As a consequece, he was captured in 1986 in Rome by the secret police of Israel and sentenced to 18 years of imprisonment. In april 2004 he left jail. During the first years in jail he wrote the poem I'm your spy. Fragments of this text are used in this piece. 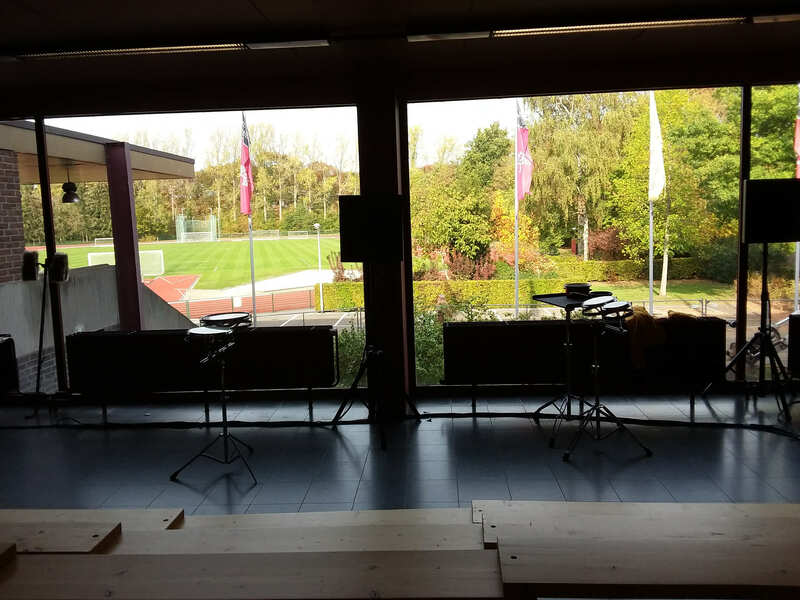 In this second part of Ohne Worte the singer and viola player are now joined by a musician "playing" on a steel brush (ormally used to clean) and a fourth musician that controls the electronics. The movement of the steel brush on the surface produces sounds with an unpredictable timing (it is difficult to know exactly when a "hair" of the steel brush will "jump" and produce a sound) and dynamic curve. The electronics (made with the Reaktor software) apply both these characteristics to the voice. This piece combines the possibilities of the player piano (controlled by a computer) and the prepared and the inside piano. While the automatic piano plays on the keys, a live performer plays pizzicati, glissandi and percussion effects on the strings, uses two ebows and changes preparations in the piano. This polyphonic work with different simultaneous tempi and timbres develops in a non-linear way, permanently balancing between standstill and progress. • Dubbelstuk is recorded on the CD "Machine Orchestra" in the Logos series Public Domain. Ohne Worte is a piece with a lot of (soft) noise in which the music often disappears. The percussionist plays on a cardboard box, the singer produces a sound in between whistling and whispering and the mixer is not only used to regulate the dynamic level of the different instruments but also to generate noise. This noise of the mixer (by setting the gain at its loudest) is normaly seen as a disturbance but in this piece it is a autonomous instrument. The (almost unaudible) basis of the piece is the song Pirate Jenny of Kurt Weill. The starting points of "How it takes place" are notions like space, place and distance. These concepts are treated literally -as physically moving in space- and figuratively -as in the spoken language where you have expressions like "a close friend" or "to be distant to someone". The latter aspect is reflected in the relationships among the musicians on the stage. Therefor "How it takes place" can also be considered as music theatre. During the performance, the musicians act as in daily life: open windows, smoke cigarettes, turn the pages of the score of another musician, etc. Distance and space are also interpreted in a musical sense: large differences in dynamics, tempo and timbre give the listener the impression that the instruments are physically far away from each other. In short: the interaction between this physical, musical and social/emotional interpretation of distance is what the piece is all about. The title "How it takes place" is extracted from the poem "Musée des Beaux Arts" of W.H. 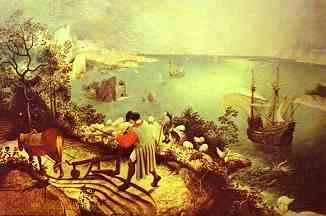 Auden, at its turn referring to "The Fall of Icarus" by Breughel. The spectator is drawn to the spatial effect of the composition: distant mountains, a boat sailing on the sea and a farmer working in the foreground. In the bottom right-hand corner -only a small detail- two legs of a drowning Icarus disappear in the sea. Apart from the references to death and sufferance, the painting and the poem give a good impression of the atmosphere in "How it takes place": some musicians play solo while others play together, smoke cigarettes or have already left the stage. • There is a recording of this piece on a CD with the Belgian magazine A+ (a magazine about architecture). This recording was made by the Flemish classical radio Klara on the première of the concert where the first version of this piece was played. • This piece was written for a concert by the Belgian ensemble Champ d'Action, on the theme of Music & Architecture. The concert was organised for a new building by the Belgian architect Stephane Beel. Silent places -i.e. places where the level of the surrounding noise is low- are diminishing rapidly in Western Europe. These places can give the visitor rest and quiet but this peace is constantly endangered because these places are reserves in the middle of a busy and hasty society. The ambiguity of these 'Silence Reserves' is the central theme of this piece. The audio track consists of recorded, non-modified violin and viola sounds. The violin and viola were prepared and played in different ways, one of them was the gypsy technique which consists of pulling a thin string tied to the violin string. Run! is inspired by my image of music which is so in a hurry that it passes itself all the time, an image of music that flees away while stumbling but continuing its run. The piano plays an important role in this piece and should have a good repetition mechanism! The tape consists of short and very fast fragments recorded on the automatic player-piano of the Logos Foundation, afterwards these fragments were edited in the Logos Studio. This piece was written for string orchestra (6 vl I, 6 vl II, 3 vla, 2 vcl, 1cb). The title is a description of the huge sound wealth which can be found in the borderland between music and sound. Melodies, rhythms and harmonies are rather suggested than clearly pronounced. The music is very fragile, it seems as if it can fall apart any moment. Nowhere's Chaos was written for a concert centred around 'The State' (1972) by Louis Andriessen. The latter piece by the Dutch composer is a reflection on the relation between music and politics. My inspiration wasn't the music by Andriessen but the philosophical-utopian tradition which started with the ideal state as described by Plato. The largest part of these Utopia's (like Utopia - Th. More) depicts a rich, just but at the same time authoritarian society. Only 'News from Nowhere' by William Morris is an exception because it is a part of the anarchist tradition. The text used in 'Nowhere's Chaos' is based on excerpts from this old (19th century) book which is still relevant to our times. In 'Nowhere's Chaos' fragments are also used from 'My journey with Aristotle to the anarchist utopia' by Graham Purchase, from press releases by the Zapatistas in Mexico and finally slogans used by Belgian action groups to defend the rights of refugees and illegal people are integrated in this piece. Music as a landscape without a human logic, wherein fragments appear and disappear alternately. Nature as a ritual, slow and brutal. The still life of nature but also the anger because of the dying nature. Phoenix was commissioned by the Walpurgis Music Theater (B). This theater asked 6 composers from Holland and Belgium to write a (short) piece of music theater on the theme of the bird which arises out of its own ashes, the Phoenix. "Phoenix" doesn't deal with this myth but with fire as an element of nature. On a text by the "first poet of Ireland" Amergin (before 700 A.D.), the singer sings and performs with imploring gestures as in ritual theatre. In this piece I consider the player piano as an instrument different from the regular piano. The player piano is unique in its potential to produce huge polyphony (an orchestra of 88 keys), complex rhythms and superhuman speed. In "Sailing the Seas of Down Below", I exploit these possibilities to the extreme, which results in a very pianistic work: the limits of the player piano (and thus of the piano itself) are explored: thirteen-voice polyphony, combined decelerations and accelerations and fast keyboard runs that one hears as a glissando. Sailing the Seas of Down Below consists out of two elements that seem contradictory at first: a tight melody in a steady rhythmic pattern (typically mechanical) and intertwining chromatic lines in a very free, improvisatory rhythm (typically human: with tempo changes and rubati). A machine such as the player piano is perfectly capable of solving this contradiction. In the final movement, the first few seconds of the piece are enlarged and presented as a slowly descending sound mass. 8 short songs on texts of North-American Indians. The character of the songs is very diverse: from odes to a seal to slanging matches and exorcist rituals.